This rugged accessory provides a low-profile sling mounting point for 1.25" web slings and has a .25" hole for H&K type quick detachable sling snaps. It can be mounted under the Tactical Light Mount Kit or alone on the left or right side of any model of Mini-Scout-Mount™. 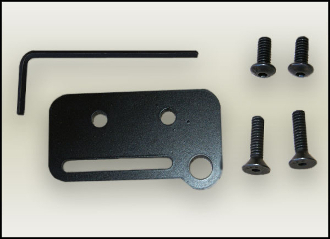 Made of durable blued steel, it installs quickly and easily with the screws and tool provided. This is a quick and easy way to set up your sling for traditional over the shoulder carry, or in a tactical cross chest-muzzle down position. Weight 1.0 oz.